MoonMarble.com - Glass Eye Studio Egg Weight - "Aqua Blue Passion Flower"
Art Glass → Glass Paperweights & Decor → Glass Eye Studio Egg Weight - "Aqua Blue Passion Flower"
This is a beautiful handmade egg weight by the Glass Eye Studio in Seattle Washington. It is clear containing a sparkly dichroic flower with an air bubble trapped in the center. Fine lines of aqua blue loop and swirl below the flower. 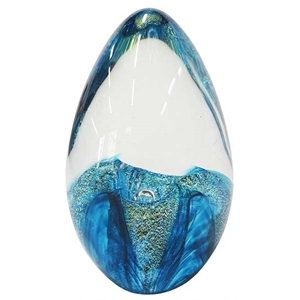 The top half of the egg is transparent (photo is showing a reflection of the bottom colors at the top of the egg). Approximately 1 5/8" x 2 1/2". This is a hand crafted item and may vary slightly from the photo.